The Kamilaroi Vaulting Team began in 1993 with 7 girls under the guidance of coach and founder Karen Foran. The horse they started with , Kamilaroi Monarch IV was loaned to the group through the generosity of the Park family of Kamilaroi Percheron Stud, Jackson, Queensland. It was carefully planned and managed process to teach the horse to accept the vaulters and for the vaulters to learn the skills and to trust the horse. Vaulting really is a team effort. The group has grown and now has in excess of 30 young vaulters. The Club is base at Kamilaroi Equestrian Centre which is also the home of Kamilaroi Performance Team. Kamilaroi is involved in developing the sport through many clinics and displays throughout the Northern NSW and Southern Queensland areas. This is a great team sport that involves a group of vaulters working as a team together with the horse. You learn correct balance and positioning on the horse and best of all it is loads of fun. 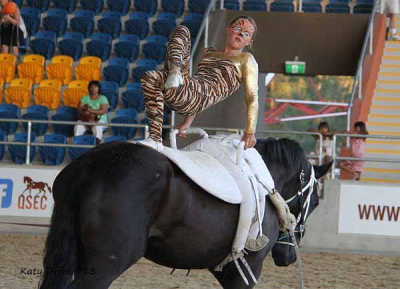 You get to perform different gymnastic movements while the horse is walking or cantering around in a circle. These gymnastic moves are also practiced on the barrel apparatus, gym mats and mini tramps. We have specially trained horses that are used for Vaulting, as the horse must be very quiet and able to cope with a lot of movement and noise. 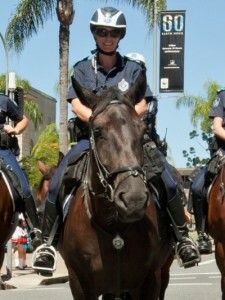 The centre educates some of the Queensland Mounted Police Horses. 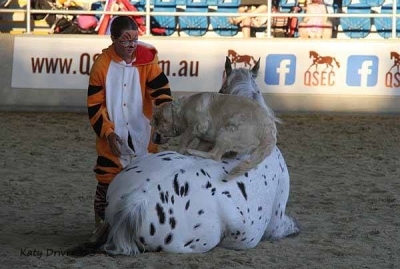 Kamilaroi Equestrian Centre offers Horse Riding Lessons and Vaulting Lesson. As well as selling of Percheron Warmbloods, Partbreds and Purebreds, which are breed by the Park “Kamilaroi”, Jackson, QLD. Kamilaroi Performance Team can cater to any event with any budget. Performance can include Trick Riding, Vaulting, Side-Saddle, Roman Riding, Free Riding & Harness.